#2 Your visitors don’t care about your company or your products. Hear the 18 website formulas that will change your fortunes. Click the image to See the Slides. What if you could finally understand why your website isn’t bringing the leads and sales your business needs? #5 Every click is a promise that you must keep. What if you finally saw your site through your visitors’ eyes? Would it scare you? On Thursday, October 25, the folks at LogMyCalls.com are sponsoring a free Webinar in which I reveal 18 of the most important formulas you can apply to your site. You have the opportunity to fundamentally change the performance of your website. I’m going to tell you exactly what questions you should be asking. Where has your well-meaning designer led you astray? How has your eager development team made the mistakes that testing shows don’t work? 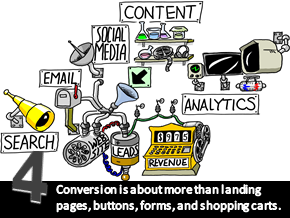 Why are do your visitors seem so hard to convert? Why is 98% of your traffic wasted? #11 The most important part of your design is the dollars it generates. 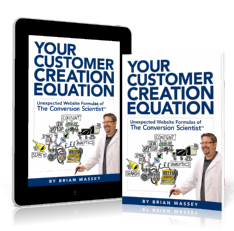 In one hour, you’ll get all of the most important points from my book Your Customer Creation Equation: Unexpected Website Formulas of The Conversion Scientist. I hope you’ll join me. See the Slides. Next PostNext What Makes Books Sell?